What better time to focus on your best friend and improve his health so you have many more years with your dog! Dynamite’s Canine Foundation Program – START HERE! Ensuring your dog is healthy and thriving does not need to be complicated, in fact, it is as simple as Dynamite’s Canine Foundation Program. Consisting of Dyna Pro and TNT, this daily foundation of nutrients can be added to raw diets and/or kibble to ensure your dog is getting what she needs, it is that simple. Adding a top-dress is imperative to improve the overall health of your dog, no matter what food you feed. We’ve learned over the years, dogs whose owners have top-dressed their meals with unprocessed, balanced supplements experience fewer allergies, joint problems, digestive upset, and other issues resulting in unplanned or “ailment-induced” veterinary visits. Additionally, dogs that regularly consume a natural balance of viable nutrients have more longevity-meaning you get more years with your furry companion. 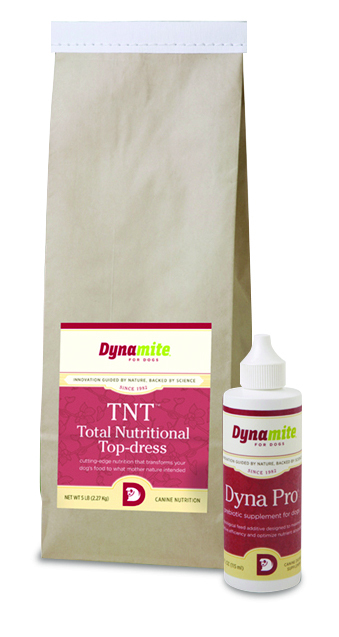 We recommend Dynamite’s Canine TNT as your supporting daily supplement. Dynamite’s unique prebiotic – Dyna Pro addresses the digestion of the dog by nourishing naturally occurring gut bacteria and encouraging them to reproduce and multiply. This is imperative for the utilization of feed and assimilation of nutrients no matter what food you are feeding. What kind of food goes with Canine TNT and Dyna Pro? If done correctly, feeding your dog a truly raw, balanced diet is best because it is how nature intended. However, feeding a high quality kibble is the next best thing and sometimes the only option. No matter which food you offer, Canine TNT and Dyna Pro work to fill the nutritional gaps of raw food and kibble diets.